Starfire® polymers can be formed into composite parts using traditional polymer forming processes to produce a thermoset part. Part is pyrolyzed to yield a porous green body (2) which is densified using polymer infiltration and pyrolysis (PIP). 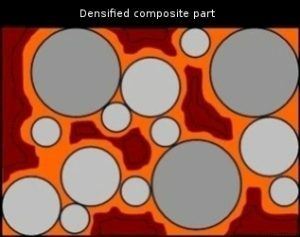 Open porosity of the part is filled with Starfire Systems polymer using vacuum infiltration. 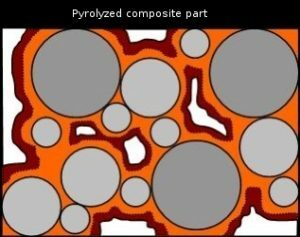 Part is pyrolyzed in an inert environment where the polymer decomposes to a ceramic, shrinking in volume and increasing in density, such that open porosity is again created. 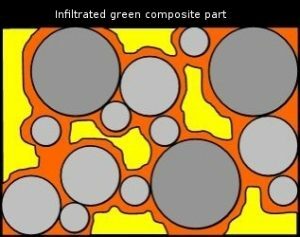 The infiltration and pyrolysis process is repeated several times (5 and 6), until a part of the desired density is obtained. 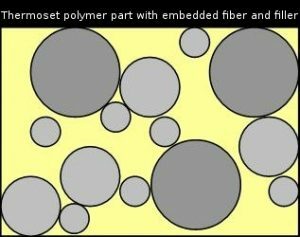 A typical number of PIP cycles is between 6 and 10, depending on final application and desired properties.